President Barack Obama declared a slow-moving lava flow from the Pu'u O'o vent of the Kilauea volcano in Hawaii to be a major disaster, and ordered federal aid to supplement state and local recovery efforts, the White House said in a Monday statement. The lava flow is encroaching on Pahoa, a rural town on Hawaii’s Big Island, threatening to destroy a major road in the already-isolated town at the site of an old sugar plantation. The leading edge of the flow has paused about 185 yards from Pahoa Village Road, the main thoroughfare, Reuters reported. 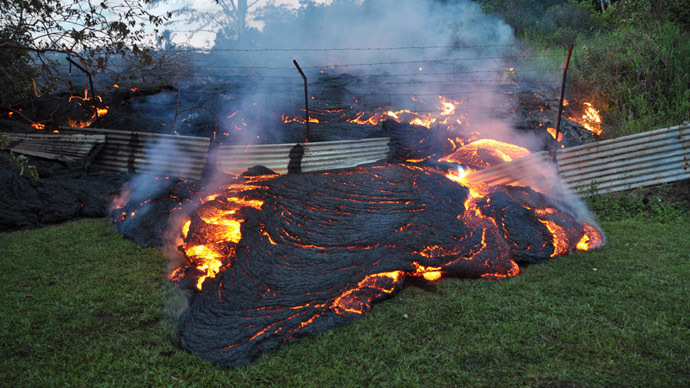 The smoldering lava is a little more than 300 feet away from a home in the town, Hawaii News Now said. 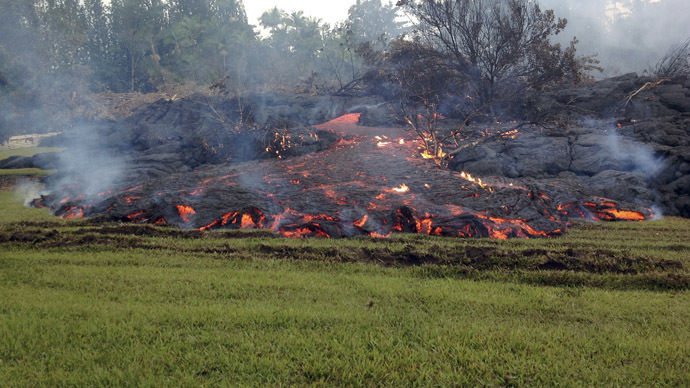 The leading edge of the lava flow is just 35 yards wide, but breakouts have expanded it to more than 500 yards wide near Apa’a Street, the Weather Channel reported. So far the lava has smothered part of a cemetery and burned down a shed, some tires and metal materials, according to the Associated Press. No homes have been destroyed and no injuries have been reported. 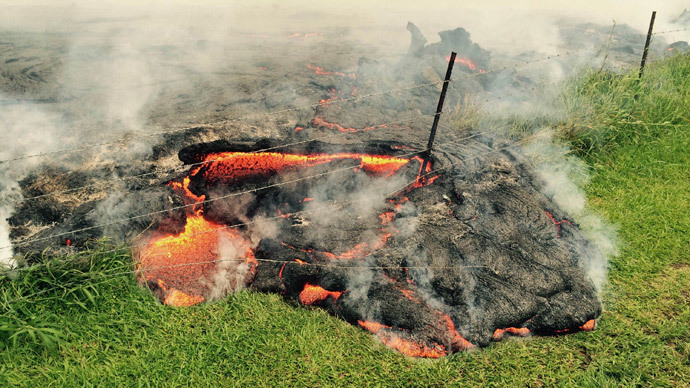 As the lava flow continues to expand further away from Pahoa, it threatens to put more people at risk, US Geological Survey geologist Frank Trusdell told Hawaii News Now. "As the flow widens of course then the downslope areas get wider as well and so the potential impact for people spreads out over a larger area," Trusdell said. The state’s National Guard deployed 83 troops Thursday to the town of about 950 residents, to assist with security, including the construction of a roadblock and other pressing safety issues. 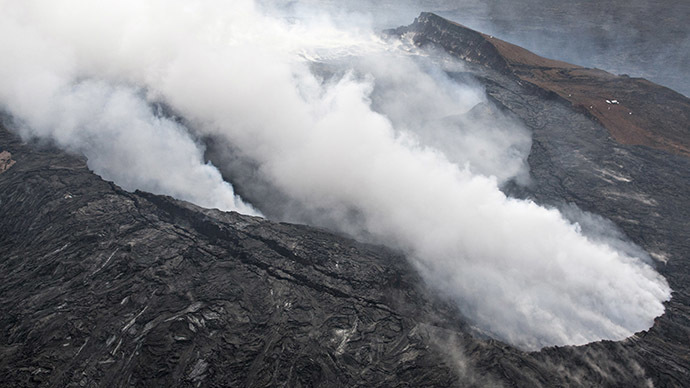 The new Pu'u O'o vent opened on the Kilauea volcano on June 27. 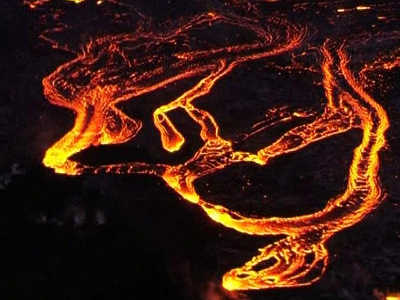 The 1,000-degree red mass of molten rock is expected to displace around 900 schoolchildren, according to KITV. “I’m very impressed and proud of the [HAAS] kids, they’ve decided to make a bad situation into something positive,” Johnson said. Gov. Neil Abercrombie (D-Hawaii) requested federal aid on October 24 to boost local emergency protective measures, including repairs, re-establishment of alternate routes in and out of affected communities and the accommodation of those displaced. Thanks to Obama’s disaster declaration, federal funding will be available to state and eligible local governments and certain private nonprofit organizations on a cost-sharing basis for emergency protective measures and hazard mitigation, the White House said. Federal Emergency Management Agency (FEMA) Administrator W. Craig Fugate named Kenneth K. Suiso as the Federal Coordinating Officer for federal recovery operations in the affected area. FEMA said additional designations may be made at a later date if requested by the state and warranted by the results of further damage assessments.